So, it is a rainy day today but that's okay. We needed some rain and it's an excuse to stay inside and do some sewing, right? We have lots of awesome classes, clubs and events to fill you in about. So get a cup of coffee (or whatever) and take time to read the whole newsletter! 1. Please register early for classes. To register you must pay or your spot is not reserved. 2. We are entering ALL names that take classes into a drawing for prize at the end of the year! You will need the pattern. 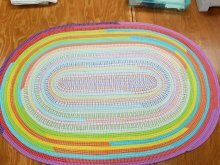 You can choose which pattern you want to make- either the oval or rectangle. You will have "homework" between first night and second night of class! We will make 1- 16" bison block. I can show you how to make this into a cute pillow, or you can make more blocks at home to complete a quilt. We will have prizes at end of the 6 months! This is a 6 month club from June 2018-November 2018. 1. You will purchase the book Grunge Love Table Runners. 2. 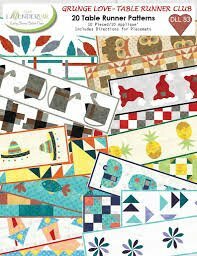 Each month you can choose to make the applique or pieced version of the runner we choose. 3. The kit cost will be $25/month (without backing) or $35/ month with backing + any taxes or shipping charges. 4. To get each month's fabrics: you can come to meeting, you can pick up (please pick up within 1 week of meeting), or we can ship to you (shipping will be around $7). 5. We will need to know the month ahead which version you'd like. You can do either version or both. If you do both you will get free backing for one. 7. Meeting will be 2nd Thursdays at 7:00pm. 8. If you choose to get your things shipped, I can invoice you each month through paypal. I can also email you and you can call in with a credit card. Sew, are you wondering what Sew Days is all about? This is a nationwide event that members of the Fab Shop Network (like us) are participating. We want to spread the word about the joys of sewing! This is happening the weeks of June 11- July 23, 2018 (skipping July 2nd week). Each shop participating will offer classes on the same project each week. Cost is $5 per class + supplies (we will have inexpensive kits ready). The projects are fun for both beginners and for experienced sewists. You DO NOT have to sign up for all classes. You can choose to attend the ones you'd like. If we have enough interest we may offer more dates each week. Kids may come but if under 12 or no swing experience they must come with an adult. PLEASE, call or stop in to register as space is limited! 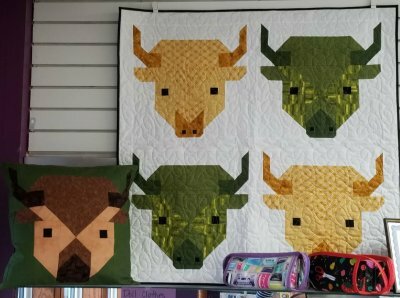 We still offer FREE open sew day at the shop. It's the 3rd Thursday each month from 10:00am-5:00pm. Bring your own machine! Bring a project to work on or find something new here to do! Yes, they are starting another FREE Block of the Week! 1. There is a "layout" that will be revealed completely at the end of the 48 weeks. I believe it will be partially revealed earlier. 2. Size will be about 72" x 78"
3. You can do your own layout and size too. 4. Blocks will be in 3 different sizes with 6" finished block being the smallest. 5. Check out the Langdon Blockheads facebook group for the link to the full release details along with fabric amount suggestions. 6. Blocks will start releasing on June 6, 2018 and there will be a NEW block each Wednesday. I will post the link in our facebook group (under files) & you can print it for yourself. 7. At the end we will have another "wrap-up" party with prizes for completing the challenge. Saturday, June 23 is June Jamboree and we will have some awesome & crazy deals to offer you then! Watch facebook for more on this! I am planning a June sale before that and I'll post that very soon. Christmas in July will be happening too the week of July 16-21, 2018. Stay tuned for those specials! One thing to remember is that we always do 20% OFF for taking the end of a bolt (no matter the size).